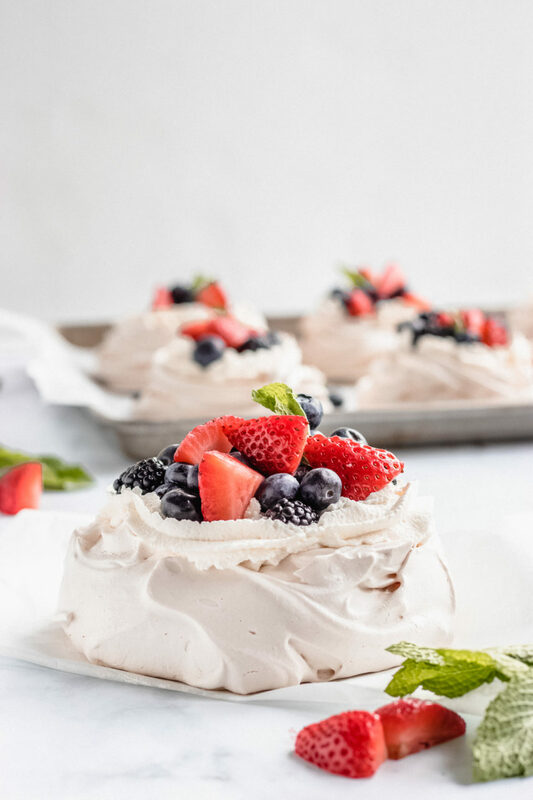 Pavlova’s have become all the rage in recent years (at least as far as social media is concerned). But that doesn’t mean anything, because there’s still a ton of people who have never heard of them. 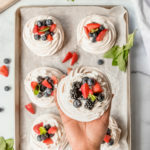 In this post, I am going to show you how to make this light and fluffy gluten-free meringue cookie, that is filled with creamy yummy goodness and fresh fruit. 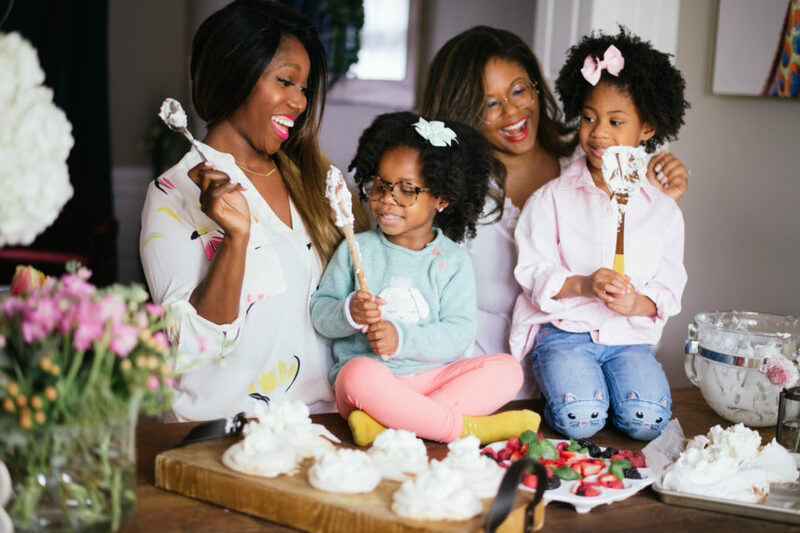 You can whip up a batch for play dates, holidays- like Easter, or as a light treat to satisfy your sweet tooth. 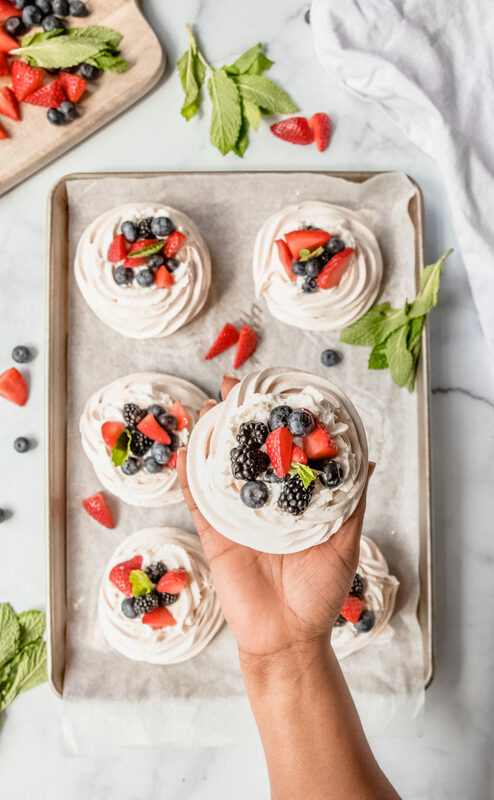 When I knew I had to make a ton of mini pavlovas to share with you, I thought it would be fun to have some friends over for Petite Pavlova Playdate. 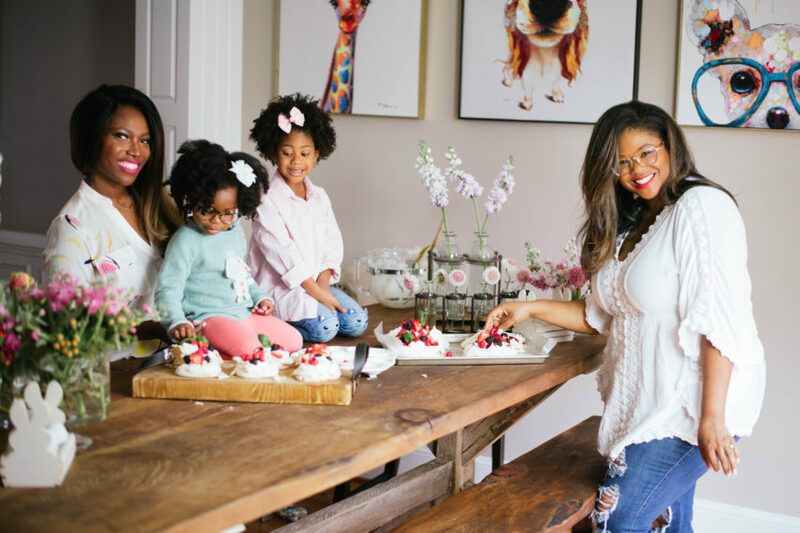 So, I invited my friend Tiffini Gatlin of Latched + Hooked and her beautiful to daughter Zoe over to the house to help Harper and I make some sweet treats! Pavlovas are always so awesome to make when there are little ones around. You don’t need many ingredients and it’s not too difficult to assemble, so the kids can help out. Also this is a great dessert for those who have gluten allergies. Make sure you start off with a sparkly clean mixing bowl. If it has the slightest amount of oil, your pavlova will be a mess! Let the meringue baskets cool in the oven. Just turn the oven off and take out about 10-15 minutes later. 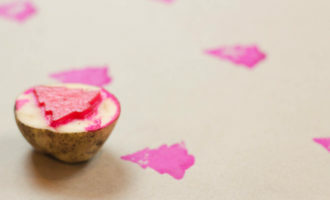 Use a dab of meringue on the back of your wax/parchment paper to keep it laying flat on your baking sheet. Use a piping bag to make meringue baskets and to fill the baskets with whipped cream. Evenly spread sugar on a baking sheet and place in the oven for about 5-7 minutes. Sugar should be warm but but not melted. Increase oven heat to 250 degrees. In a large clean mixing bowl start beating 6 egg whites at a medium speed. To your egg whites, add fresh squeezed lemon juice, corn starch, and vanilla extract. Once the egg whites start to form soft peaks, you can begin to slowly add your sugar. Increase your speed to high. Mix until your mixture is completely smooth, glossy, and forms stiff peaks. Use a piping bag to create 6-8 basket shapes with meringue mixture. You can also use 2 large spoons to freeform the basket shape. *Make sure the center of the baskets are hollow in the middle because that’s where our filing will go. Put it in the oven at 250 degrees for about an hour and a half. Turn off the oven and leave your new meringue baskets to cool completely. Fill your cooled meringue baskets with that whipped cream. Top with with your favorite berries or other fresh fruits. 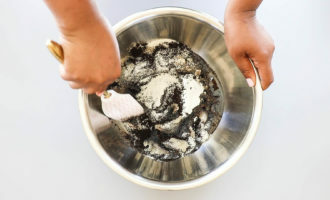 It’s extremely important that your mixing bowl is clean. It can mess up your batch of meringue if it is not. If you enjoy this recipe, then you may also enjoy my Very Berry English Trifle.